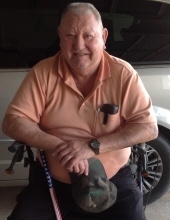 Funeral services for Guy Hodges Veal, age 77 will be held at 11:00 AM Thursday, April 11, 2019 at Bethesda Baptist Church, with interment to follow in the church cemetery. Rev. Barron Powell and Rev. Nolon McDaniel will officiate. Mr. Veal was born November 28, 1941 in Laurens County, Georgia. He was the son of the late Guy Harden Veal and Thelma Fordham Veal Sawyer. He was also preceded in death by his granddaughter, Tabitha Lynn Veal and a brother, Tommy Veal. He was retired from the United States Army. He was a member of Bethesda Baptist Church where he served as a Deacon. Mr. Veal passed away Sunday, April 7, 2019 at Fairview Park Hospital. Mr. Veal is survived by his loving wife, Flossie Veal of Dublin, 2 sons, Guy Anthony Veal of Dublin, and David Earl Veal of Dublin, 2 sisters, Hilda Walls of Dublin, and Bobbie Jo Davis of Dublin, 4 grandchildren, Kirk Veal, Holly Darley, Daniel Veal, and Stephen Veal, and 6 great-grandchildren, Belle Darley, Clark Darley, Lilliana Veal, Luke Veal, Logan Veal, and Siddalee Graham. Pallbearers will be Kirk Veal, Daniel Veal, Stephen Veal, Josh Darley, Chad Burch, and Brad Smith. The Deacons of Bethesda Baptist Church will serve as Honorary Pallbearers. The family will receive friends from 10:00 AM until 10:45 AM Thursday, April 11, 2019 at Bethesda Baptist Church. In lieu of flowers the family asks that donations be made in memory of Mr. Veal to Bethesda Baptist Church Youth Fund C/O Flossie Veal at 2595 Greg Couey Road, Dublin, GA 31021. To send flowers or a remembrance gift to the family of Guy Hodges Veal, please visit our Tribute Store. "Email Address" would like to share the life celebration of Guy Hodges Veal. Click on the "link" to go to share a favorite memory or leave a condolence message for the family.